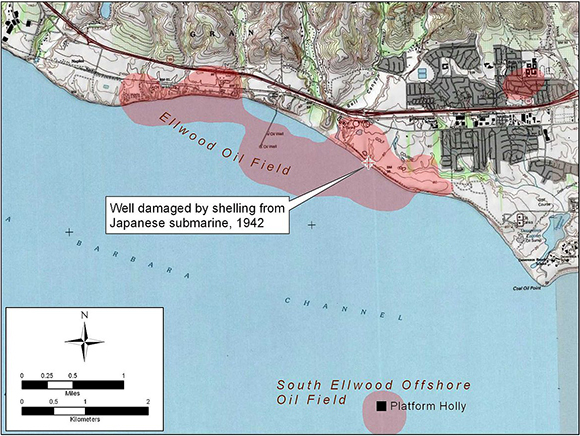 In a World War II event known as The Bombardment of Ellwood, a Japanese submarine snuck in close to the Santa Barbara coastline, just off Goleta, California on February 23 1942. The I-17 sub opened fire on targets in the area and even though damage was minimal, the event was key in triggering a West Coast invasion scare. Soon sirens blared and the area underwent a blackout to keep the sub from identifying more landmarks to attack. The event marked the first shelling of the North American mainland during the conflict. 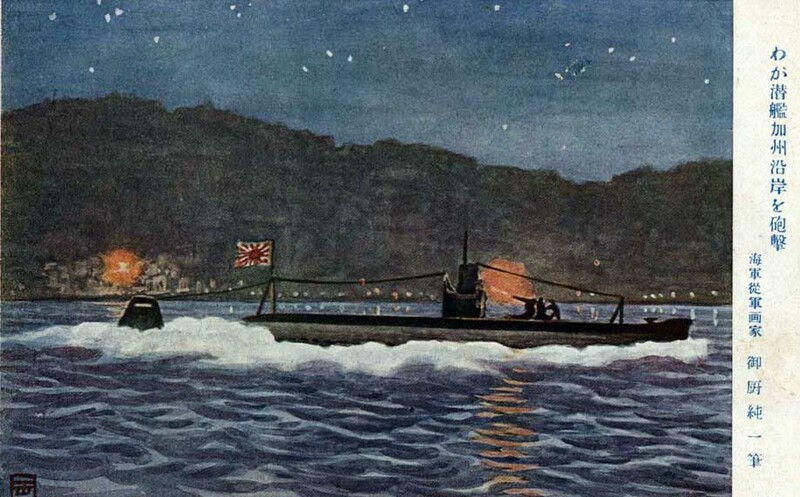 Seven Japanese submarines patrolled the American West Coast after the attack on Pearl Harbor. The subs skirmished on occasion with U.S. Navy air or sea forces and even sunk a few merchant ships. Eventually the submarines returned to Kwajalein to resupply and then returned to patrol American waters along the West Coast. Imperial Japanese Navy submarine I-17 was one of these vessels and carried 101 officers and crew under Commander Kozo Nishino. 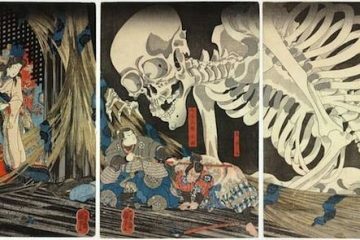 The attack on Goleta seems like a very odd choice but it makes more sense when we look at Nishino’s previous experience. Before the war, Nishino commanded a merchant ship which he sailed through the Santa Barbara Channel. Nishino would stop at the Ellwood Oil Field, where his ship took on oil before returning to Japan. This would be his target during the bombardment. 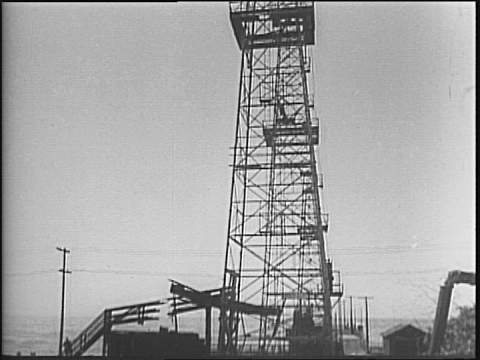 Reports of odd lights were documented at 7:00 pm on Feb. 23rd 1942, right around the same time as Nishino’s I-17 came to a stop off of the Ellwood oil field. Under the cover of dark, Nishino gave the ordered a gun crew to take aim at a fuel tank on the bluffs above the beach. 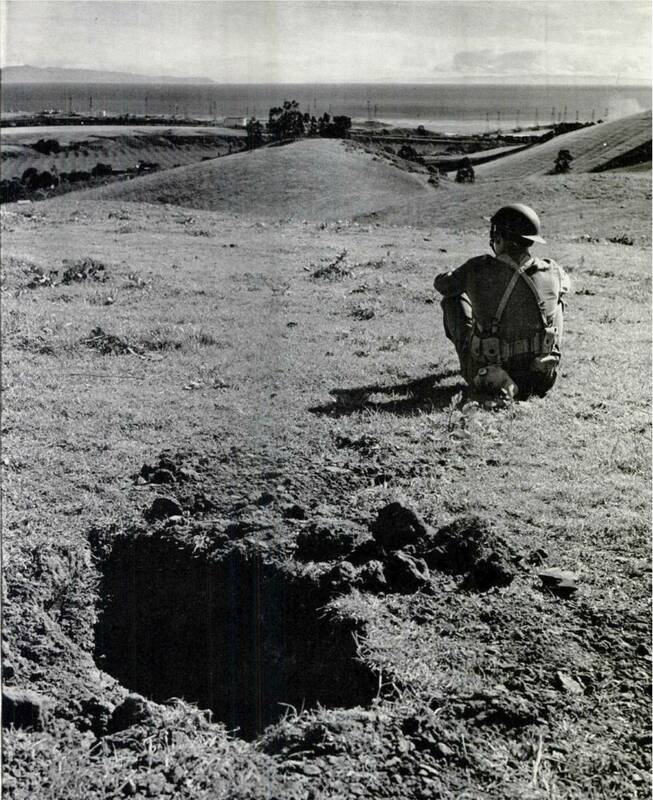 The first barrage of shells was launched at 7:15 pm with rounds landing close to one of the storage facilities. A few oil men were still on duty and heard the first rounds impact the shore. At first it was a suspected internal explosion, but a worker spotted the blinking lights of the I-17 in the dark. An employee named G. Brown later described the attacker as so big he thought it was a cruiser or destroyer possibly. Nishino set his sights on the second storage tank as Brown immediately called the police, saying that they were under fire from an unknown assailant. The shells continued to rain onto nearby ranches and businesses. A shell eventually found its target and struck the Ellwood Pier, damaging it slightly. A derrick and pump house were destroyed, while a catwalk was damaged. 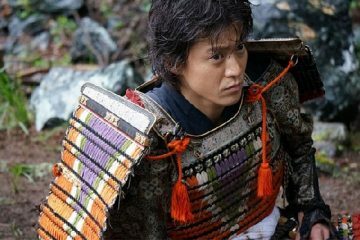 After 20 minutes, Nishino ordered his men to cease fire. By this time many residents had called to report what they were seeing and believed that the sub was possibly communicating to contacts onshore. Blackouts were ordered along the entire Santa Barbara and Ventura coastlines as a security measure. 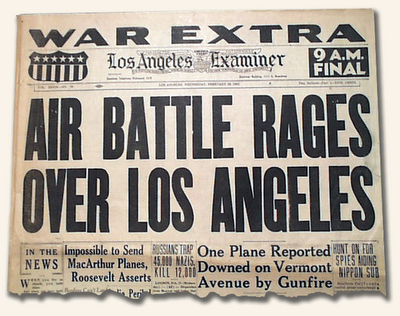 On the night of 24 February, the mysterious Battle of Los Angeles took place, in which coastal defenses responded with hours of anti-aircraft bombardment to reports of the sighting of “enemy aircraft”. What they actually saw is still unknown. The Japanese submarines assigned to duty off North America conducted the bombardment of Fort Stevens on the Columbia River, and attacked a Canadian lighthouse on Vancouver Island. 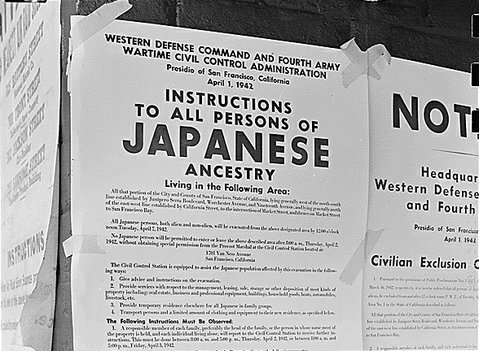 Two months after the Japanese bombing of Pearl Harbor, U.S. President Franklin D. Roosevelt ordered all Japanese-Americans to evacuate the West Coast. This resulted in the relocation of approximately 120,000 people, many of whom were American citizens, to one of 10 internment camps located across the country. Traditional family structure was upended within the camp, as American-born children were solely allowed to hold positions of authority. Some Japanese-American citizens of were allowed to return to the West Coast beginning in 1945, and the last camp closed in March 1946.